Ondo state police officials have arrested one Damilare Olotu, a bricklayer by profession who allegedly killed his wife through food poisoning. 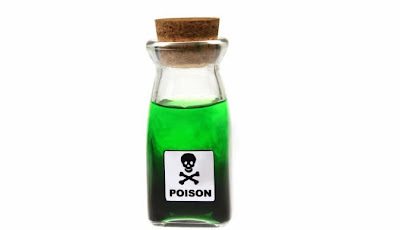 The 47-year-old Ondo indigene allegedly poisoned his 45-year-old wife identified as Mary, a trader from Kwara state over her inability to conceive. We learnt the suspect married a 2nd wife identified as Kemi who hails from Igbara Oke in Ondo state and she bore him 2 children. The suspect who is from Akure used to live with the deceased in Ibuji, Ifedore LGA of Ondo. Contacted, the police image maker, Wole Ogodo, said investigation into Mary’s death was on-going, noting that the case has been transferred from Igbara Oke to the headquarters in Akure for further investigation. The corpse of the deceased woman has been transferred to a local mortuary for autopsy. What a wicked world! May her soul rest in perfect peace. he could have just divorce her and marry another woman for God sake,is God that give child not the woman is a gift from heaven Father.let them die in prison both husnad and the second wife so the 2 children both have will surfare like the only child this late woman have,since they are both wicked, and it sames to me,the late woman have money and property than the husband and second wife,if not why killing her. The heart of man is full of wikedness, who can kknow it???????????? Lord av mercy on us in dis LGA oo, we r in d end time. Inhuman human killing human i no come 2 judge o. People u dont need to say dt let leav every thing to God God know everything dan us. AAAAA SO SAD, WHY NOT LET HER GO, INSTEAD OF KILLING HER? THE WICKED WILL NEVER GO UNPURNISHED YOU KNOW, ANOTHER MAN WILL TAKEN HER JUST THE WAY SHE IS.